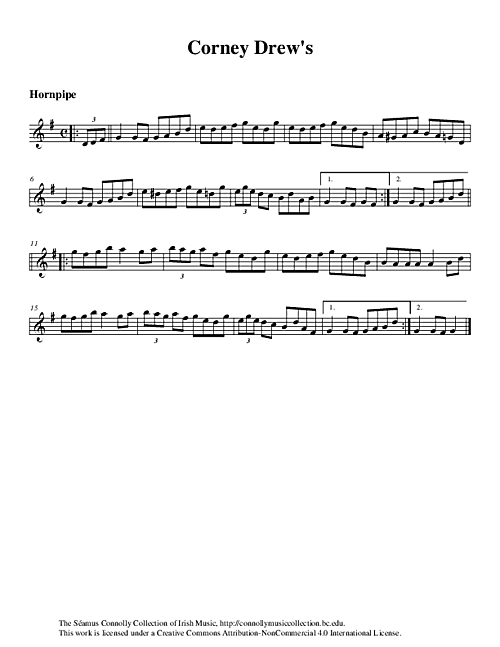 This hornpipe as played on this recording comes to us courtesy of fiddle player Liz Knowles. The original sources for the tune, Denis Murphy and Charlie Mulvihill (fiddle and accordion, respectively), recorded it for Ciarán Mac Mathúna's American Journeywork programme in 1963. I gave this recording to Liz and she graciously played Denis's and Charlie's version for this project. A different version may be found in Captain Francis O'Neill's 1001 Gems collection of music. Some transcriptions are based on historical source recordings. More info. Knowles, Liz (fiddle) and Broaders, Pat (bouzouki), “Corney Drew's,” The Séamus Connolly Collection of Irish Music, accessed April 20, 2019, https://connollymusiccollection.bc.edu/document/421. This website was created through a partnership with Séamus Connolly and the Boston College Libraries (2016). All materials on this site may be freely shared and adapted according to the terms of the Creative Commons Attribution-NonCommercial 4.0 International License. Suggested project citation: Seamus Connolly and Boston College Libraries, 2016. The Séamus Connolly Collection of Irish Music. DOI 10.17605/OSF.IO/DRFS8. Available at: osf.io/drfs8.